Learn how to make a cinnamon swirl bread. This bread is tender and sweet and swirled with a buttery cinnamon sugar swirl. You can even sprinkle in some raisins or chocolate chips if you like! Then, use the leftover bread for French toast! 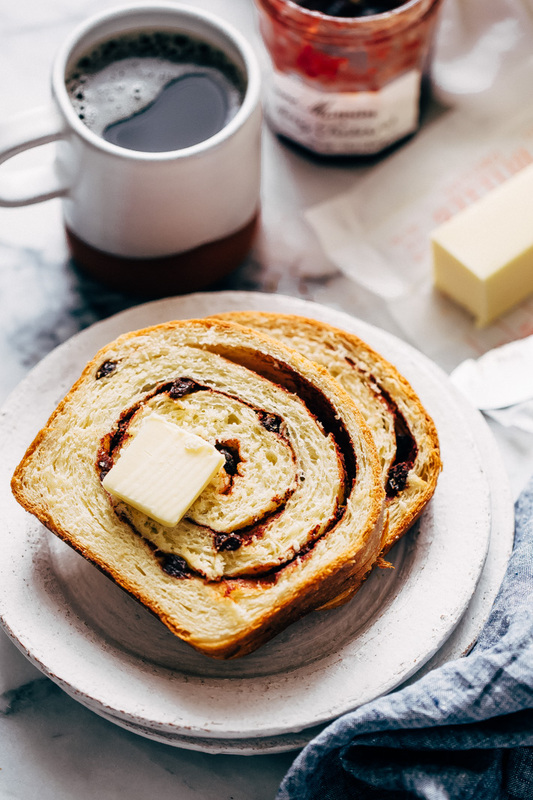 Tender white bread with swirls of buttery cinnamon sugar, speckled with raisins. Entirely made from scratch and so mouthwatering. As a bonus, the whole house smells like fall — no scented candle here. Just all real food smells. You guys know I’m on a baking kick lately, and cinnamon swirl bread is just the newest recipe in my arsenal of baked goods. As with most of my baked bread, I sneak in some instant mashed potato flakes to gives this cinnamon bread a whole new level of tenderness. I kid you not, 12 slices of this stuff disappeared in a matter of 48 hours, and I’m itching to get back in the kitchen because I still. want. more. I came across a cinnamon bread recipe from the pioneer woman  when I was researching where to start. I tested her method but found that though it was delicious, it was missing a little bit of that flavor and texture I was aiming for. So I decided to go back to my old trick. Ever since I made my basic one-hour dinner rolls , I’ve been sneaking instant mashed potato flakes into all the bread I make. They add so much tenderness that I honestly don’t see myself ever turning away from this unique ingredient. And if you’re worried about the taste, don’t. You can’t even tell it’s there. They just add a luxuriously sweet and creamy texture to the cinnamon swirl bread, one that was unquestionably lacking when I tested the recipe without it. I know, making bread can be a bit intimidating. I’ll be the first one to tell you I was deathly afraid a few years back. Never in a million years did I think I’d be testing and sharing cinnamon swirl bread with you. If you’re new to bread making, I have three helpful suggestions for you. 1.) read the instructions through at least twice before starting. That way you know exactly what comes next in the recipe. 2.) have all your ingredients ready to go before you get started. Trust me; things go a lot smoother when you aren’t trying to open the refrigerator door with dough all over your hands! 3.) be patient don’t let the process of doughmaking frustrate you. Put on a little relaxing music in the background, make yourself a cup of coffee or tea before you start and just let the bread making process consume you. 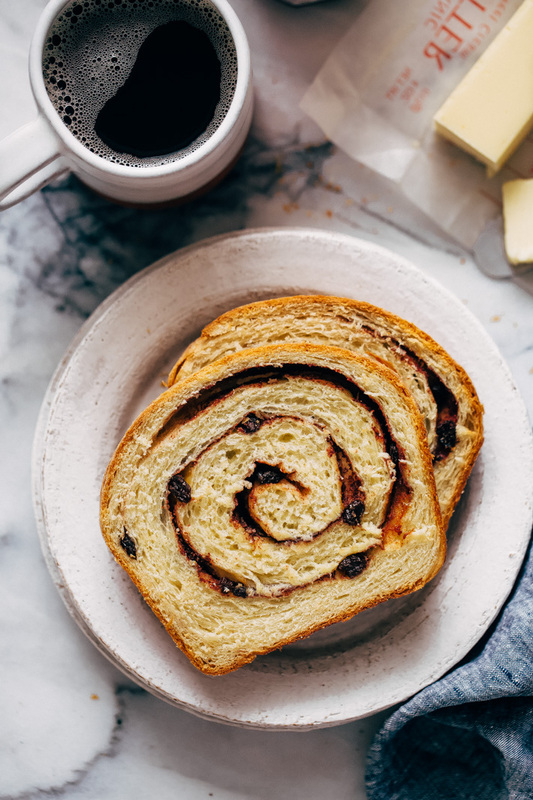 I want to be sure you’re comfortable with breadmaking by the end of this post, so I’m sharing a ton of extra pictures and information on the cinnamon swirl bread today. First, let’s talk about the yeast starter. Just like the starter we made for our rosemary focaccia bread,  we’re going to give the yeast about 15 minutes to bloom. To start, we’ll melt the butter for 15 seconds or until it’s completely liquified. Then, pour in the milk and sugar and heat it till it’s lukewarm (about 105-110ºF). Sprinkle with the yeast and stir to combine. Next, just let it hang out for a bit. If your yeast isn’t bubbling and foamy after that much time, it’s one of two things: 1.) your liquids weren’t at the correct temperature or 2.) your yeast is expired. Then, we’ll just combine everything in a stand-mixer  (affiliate link) and let the machine knead the dough for roughly ten minutes. Once the dough for our cinnamon swirl bread dough comes together, allow it to rest for at least an hour or until it doubles in size. I always do this in my dryer. Yes, the kind I dry my clothes in. Just let the dryer heat up for about 5 minutes, turn it off, place your bowl inside and don’t open the door for an hour. It always does the trick, even in the dead of winter, your bread will RISE. 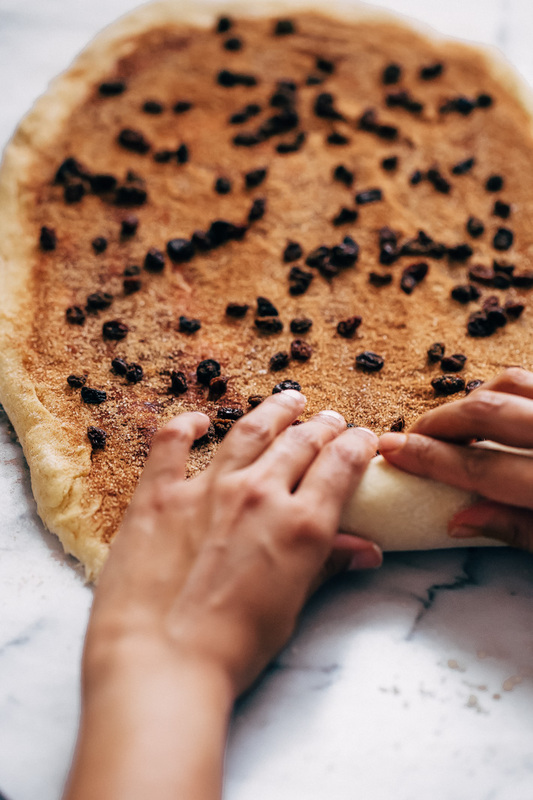 Then we’ll roll the dough out into a large rectangle, about 9 x 24 so that we can spread on softened butter, sprinkle the bread with cinnamon sugar and dot it with raisins. Of course, you can swap the raisins for butterscotch chips or chocolate chips if that’s more your thing. 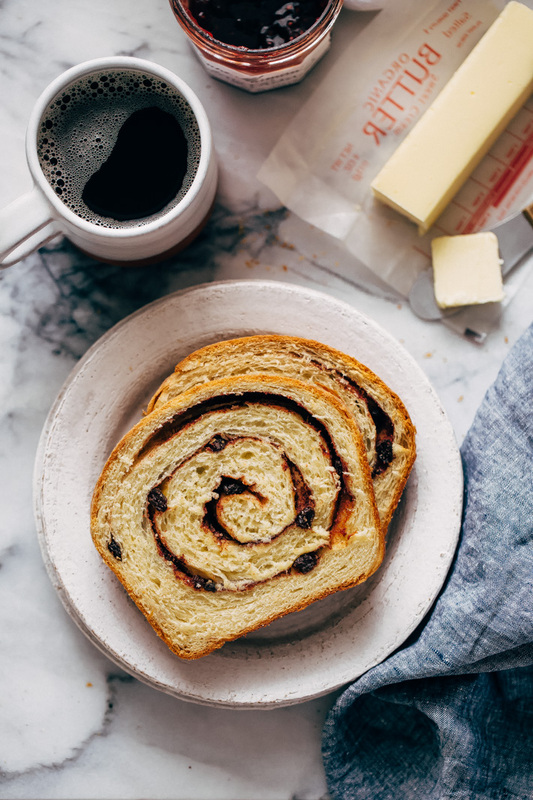 Make this cinnamon swirl bread how you like it! Next, we’ll roll up the bread. Take your time in doing this, you don’t want to roll it too loose, or you’ll have large holes in the bread. You want to be gentle yet firm when you’re rolling. Using both hands, lift and place it in a greased 9×5 loaf pan  (affiliate link). Now we’ll let the dough rise a second time before moving forward and baking the bread. Making sure your liquids are 105-110ºF is essential. If it’s too hot, just let it sit out for a few minutes until it’s just warm to the touch. You don’t want to add it in until it’s the right temperature. Adding it to hot liquid will cause the yeast to die, and the dough won’t rise. This recipe calls for rapid-rise or instant yeast. Rapid-rise yeast cuts back on the amount of time you need to proof the dough, thus allows the bread to rise quicker. Make sure your packet isn’t marked ‘active dry yeast’. If it is, you can still use it but know that it will take significantly longer than the times specified to let the dough rise (for both rises). Lastly, make sure to check the expiration date on the yeast before starting. Sometimes, it’s something as small as that that causes the recipe to produce mediocre results. 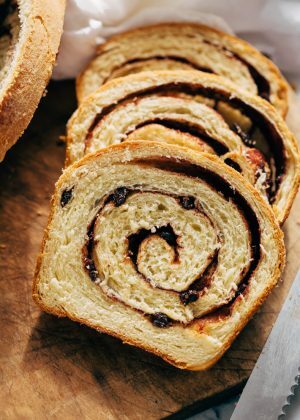 Okay, I know that was a long post, but I just wanted to cram as much information as I could to help set you up for tons of success when you make a batch of homemade cinnamon swirl bread. I serve this simply with a little butter the first day and then turned my leftover cinnamon swirl bread into french toast. It’s seriously a game changer. 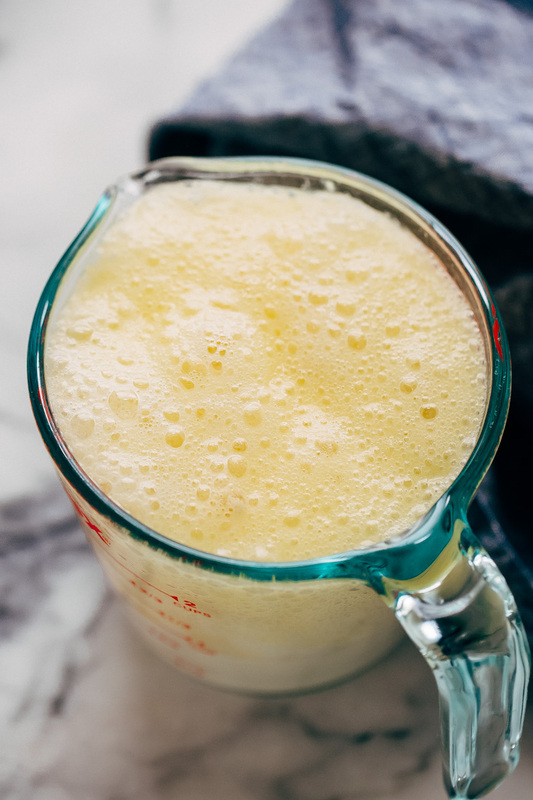 Bloom the yeast: Place 5 tablespoons of butter in a 4-cup measuring cup  (affiliate link) and melt the butter in the microwave. Measure out 1/3 cup of sugar in a bowl. Add the milk and 2 teaspoons of sugar from the previously measured 1/3 cups. Heat in the microwave for 30-40 seconds or until the milk reaches 105-110ºF. Sprinkle yeast over the top, stir to combine, let sit 15 minutes. 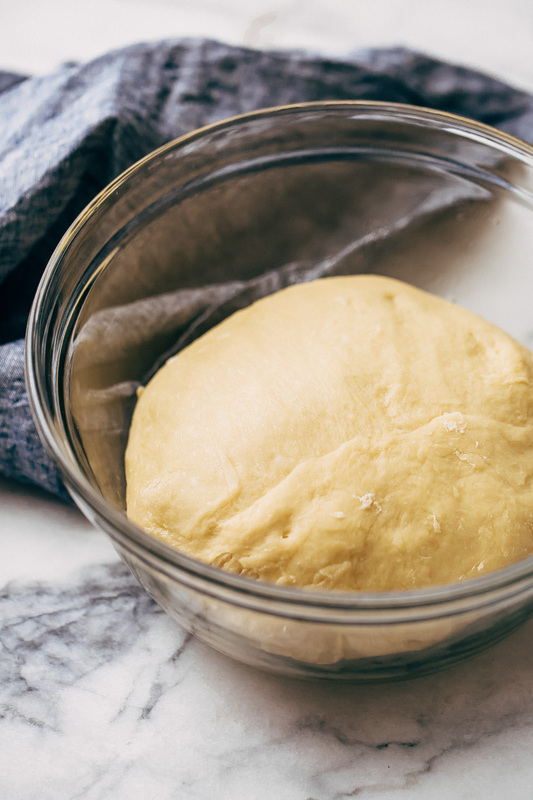 Make the dough: Meanwhile, in the bowl of your electric mixer  (affiliate link) fitted with the dough-hook attachment  (affiliate link), add what’s remaining of the 1/3 cup of sugar, 3 1/4 cup flour, potato flakes, and kosher salt. Turn the mixer on briefly to allow the ingredients to combine. With the mixer on low, slowly pour in the activated yeast mixture. Add the eggs, one at a time, waiting in between to allow the egg to mix in fully. When combined, increase speed to medium and run the mixer for 10 minutes. While the dough is mixing, drizzle a large bowl with a little oil and set aside. Remove the dough from the hook, if you still feel it’s too sticky, add 2 tablespoons of flour, and knead it in the bowl a little. If the dough is still sticky and hard to work with, add the remaining 2 tablespoons. Shape dough into a ball using your hands and place it in the oiled bowl. Drizzle a little oil on the top, wrap with plastic wrap, and let the dough rise in a warm place for 1- 1 1/2 hours or until it doubles in size (see notes). Make the swirls: Flour a flat surface and turn the dough out. 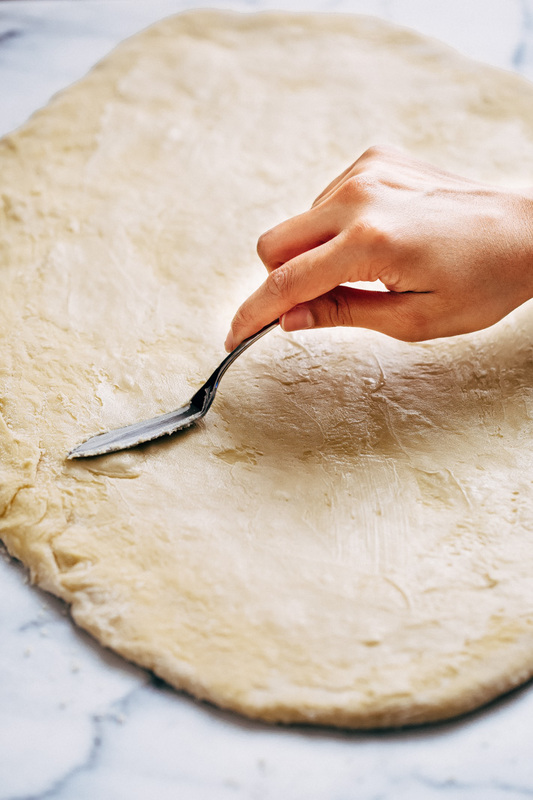 Roll the dough out into a 9×24 inch piece. Spread the softened butter on top. In a small bowl, combine the remaining 1/3 cup of sugar and cinnamon. Sprinkle evenly over the dough and if desired, sprinkle with raisins. Start rolling gently but firmly, using both hands. It’s easier if you start at the far end and roll the dough towards you. Pinch the seams to contain the cinnamon sugar. 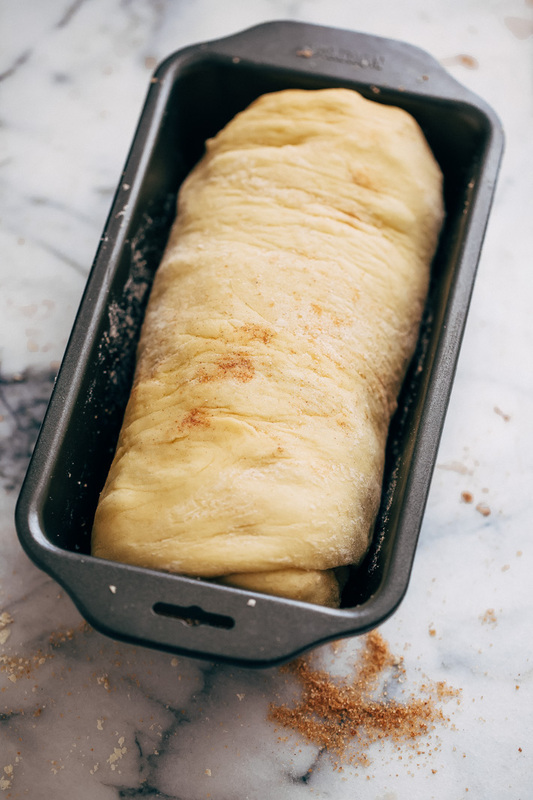 Spray a 9×5 loaf pan  (affiliate link) with a little cooking spray and gently lift the dough and place it, seam side down, in the prepared loaf pan. Cover with plastic wrap, let the dough rise for another 1 – 1 1/2 hours. Bake: Position a rack in the center of the oven and preheat the oven to 350ºF. Melt the remaining 1 tablespoon of butter in the microwave and using a pastry brush, spread the butter on the dough. Bake the bread for 40-45 minutes or until the dough rises and browns on top. Mine took 43 minutes. Remove the bread from the pan and let cool before slicing and enjoying! Leftover bread makes amazing french toast. I like replacing some of the all-purpose with bread flour in this recipe, however, this is optional. I used about 1 1/4 cups of bread flour and 2 cups of all-purpose. For additional dusting, I stuck with more all-purpose. You can swap the raisins for butterscotch or chocolate chips if you’d like!